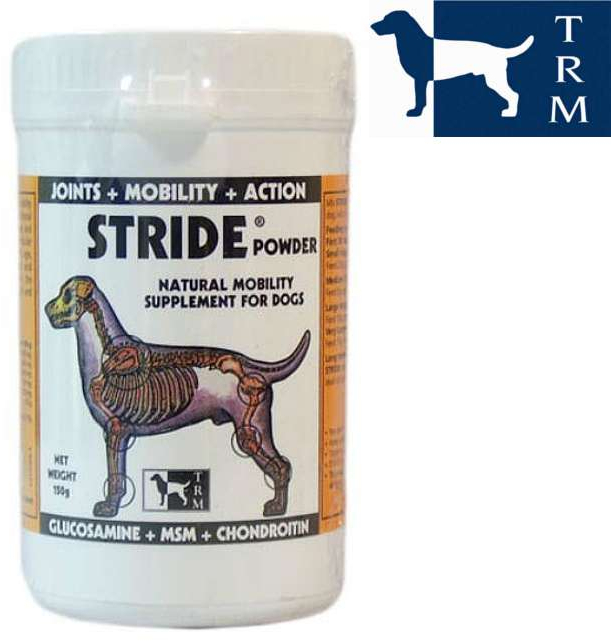 Stride Powder is a complementary feeding stuff for the nutritional promotion of healthy cartilage and joints in dogs. 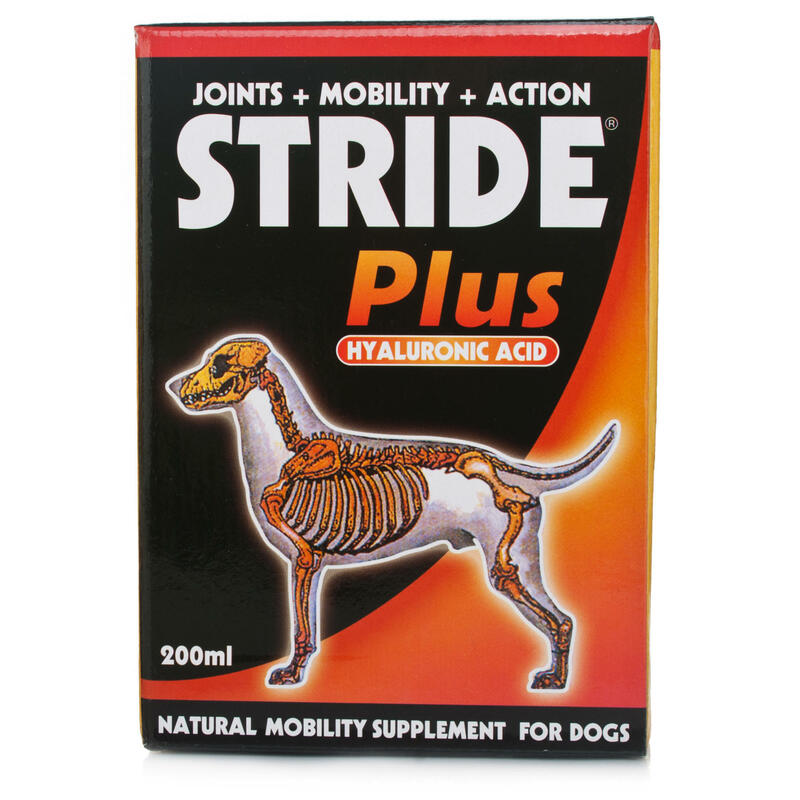 Stride Plus Liquid is a complementary canine nutritional supplement designed to help encourage healthy cartilage and joints. Joint troubles can majorly impact a dog's quality of life, with noticeable effects evident in decreased activity and the inability to play or enjoy walks. Ideal nutrition is vital for the continued promotion of joint health, leading to a promotion in your pet's mobility. Small dogs (Up to 5 kg): 2.5g daily for 30 days. Medium dogs (5kg to 15kg): 5g daily for 30 days. Large dogs (15kg to 30kg): 10g daily for 30 days. Very Large dogs (Over 30kgs): 15g daily for 30 days. 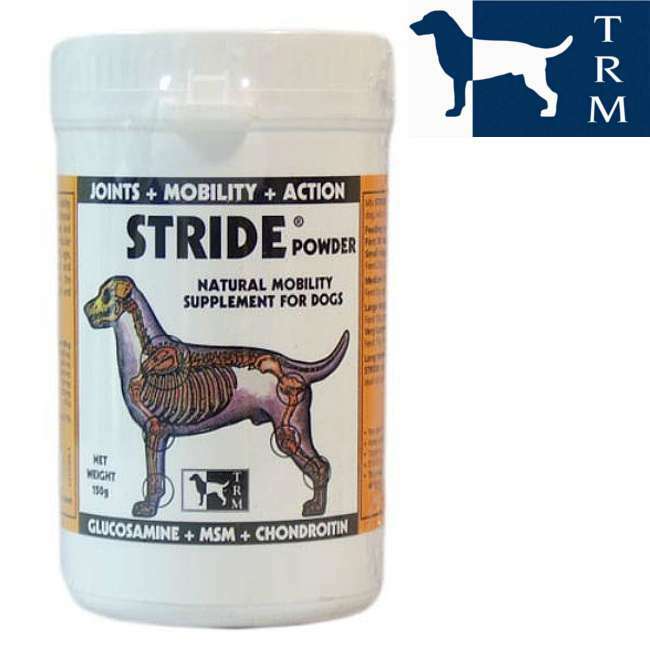 For longer term use, feed STRIDE Powder at half the above quantities. A measuring scoop is enclosed in each pack, a very heaped scoop measures out approximately 10g of powder. Small Dogs (Up to 5 kg): 2 ml daily for 30 days. Medium Dogs (5-15 kg): 4 ml daily for 30 days. Large Dogs (15-30 kg): 8 ml daily for 30 days. Very Large Dogs (Over 30 kg): 12 ml daily for 30 days. Chondroitin Sulphate 330 mg & Hyaluronic Acid 7,450 mcg. For longer term use, feed Stride Plus at half the above quantities. A dosing pump which dispenses 1 ml and a measuring cup are enclosed in each pack. 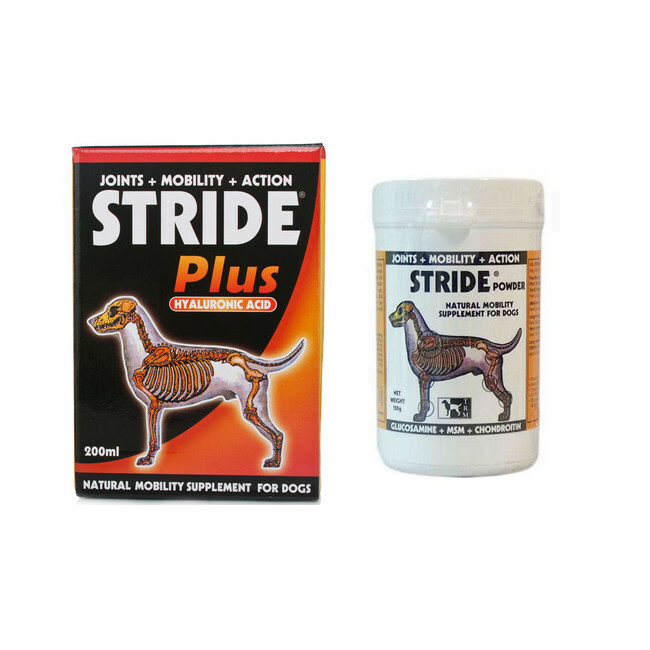 Below are some recent questions we've received regarding Stride for Dogs, including answers from our team. Is this gentle on the stomach? My 14 year old terrier has been on a supplement that I can no longer obtain. He has a very sensitive digestive system as well as having to be on a very low fat diet, he suffers from very stiff and at times painful hind legs, he can now only manage very short slow walks. Would this supplement be suitable?? 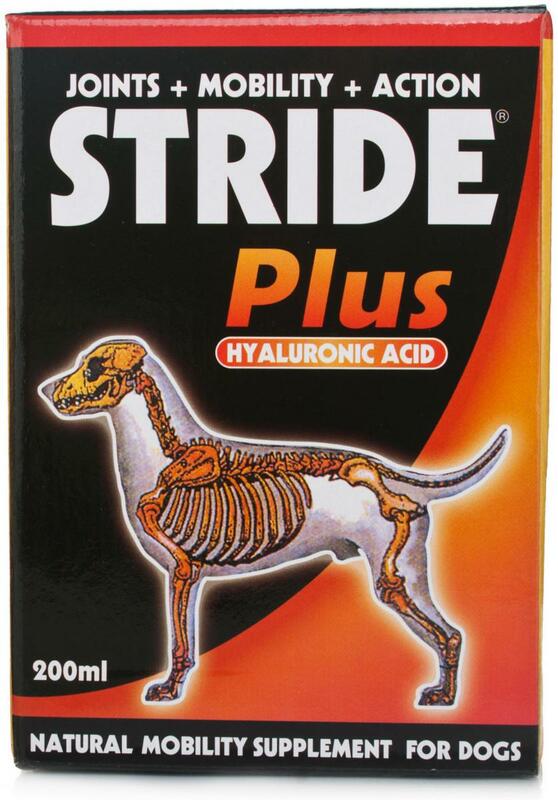 Stride Plus is very unlikely to upset his digestion, though given his situation I would give him a half dose for the first week just to introduce it gradually to his digestive system. Presuming all is well at that point, I would increase this over a few days to a full loading dose for 30 days. After that, it would be usual to cut back to the half dose long-term. I think it will probably help his joints, but there are limits as to how much one can expect from a 14 year old dog. I would also just mention that there is a very similar product to Stride called Yumove which you might wish to try. It is proving very popular at the moment and appears to be very effective. Likewise it should be fine for his digestion, though I would start on the lower dose just to be sure.